Have you ever spent hours or even the whole day to go to the furniture shop and look out for a wooden desk with a stylish look matched with a super sleek table top? Sometimes, you have even wasted your time and energy without finding your favorite one. Those old days are gone. Today, thanks to the modern world and technology that glass computer desks have entered the market and made the things way easier. A glass computer desk does not only give your room a stylish look but also a free from everyday wear and tear. To get these fancy looking desks, you won’t even have to go to furniture shop. Just spend 2 minutes in front of your computer and you would get your favorite glass computer desk. Whether it’s a work place or home, a sophisticated clean desk can make you work more. So here we have listed down the 9 best glass computer desks right now in the market. Have a look at the details. 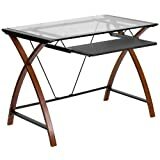 Built with smoked glass and black powder coated metal, Mainstays Solar Glass-Top Desk is a good computer desk at a very reasonable price. This product offers you the full liberty of work. Being lightweight and portable, you can move it anywhere you want. 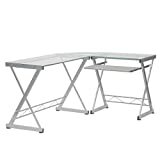 This desk comes in 36.0 L × 20.0W ×30.0 H dimensions and is an ideal desk for the tight work place. The table top is made of firm, sturdy, and solid glass. The desk can be disassembled and move around easily. You can assemble the assortments easily too. This table has been designed keeping all your demands in mind. It consists of a pull-out keyboard tray, mouse, and other essential stuff. A fancy looking table that will capture your heart at the first glimpse itself. The beautifully curved legs and the perfect rung add a unique attractiveness and solidness to this table. This desk is a bit larger than the Mainstays Solar Glass-Top Desk. The height is the same but width and length differ a bit. It comes in the dimensions of 47.8×23.8×30 and has a weight of 48.5 pounds. If you keep plenty of other stuff along with your laptop, go for this one. The big size of this desk makes you handle everything perfectly. The curvy legs are made of solid wood and are supported with two robust metal rods. The sturdy glass of table top is framed by two wooden strips. If you want a simple, solid, and good looking glass desk, this one would be the best. 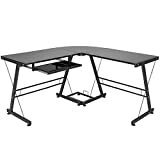 Made of substantial steel and painted with black color, Yaheetech Black Glass Computer Desk offers the utmost flexibility of work. It has a sliding keyboard tray, drawer, wide table top, and of course a solid glass. The large size of table surface can allow you to use even two monitors together. The quality, functionality, and the design of this desk really align with its price. Simply elegant with a fusion of fancy look and antique wood piece, One Space 50-JN15K05 Glass and Wood Computer Desk has really a distinctive look among its all competitors. This computer desk would definitely enhance the décor level of your room. The sturdy glass surface framed by superb MDF composite solid wood assures the smoothness as well as the stability of the table. The table top is so well designed that you can keep up to 110 pounds weight without any harm. The brand has been on the market for almost 100 years. With the fact, you can assume the reliability and quality level of it. This desk has something different which you can’t find in above mentioned four desks. It comes with 3 drawer cabinets including key and lock for each drawer. So, if you always keep hundreds of notes along with you, you can’t find any desk better than this. The chocolate color of drawers and the table surface gives it an elegant as well as stylish look. The legs are made of robust metal and are coated in silver steel color. This desk is designed with so many functionalities that it might take some time to assemble the desk entirely. Shaped in ‘L’ form, this multifunctional desk allows you to use it as two in one. This large desk can be separated and used into two parts. If you wish, you can assemble both the parts together or can use it separately. The desk is thoroughly black powder coated. The black glass of table top gives a sophisticated look and the long-lasting durability. Legs are made of solid metal and coated with black powder. They also have plastic foot caps which ensure the floor to protect from any scratch. This glass computer desk is the biggest among the above-mentioned desks. It comes in the dimension of 51 L ×19.25 W × 29 H.
Probably the most stylish glass computer desk in this list. The 8mm tempered glass and the hugely supported curved metal rods put this desk apart from its competitors. It also comes equipped with a pull-out keyboard tray which can take up to 33Lbs weight. The best thing about this glass computer desk is that it comes with 5 years warranty which is indeed a bonus. The desk is also very easy to assemble as compared to other desks. 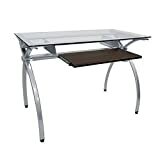 Overall, if you want solid, stylish, multifunctional, and modern looking desk altogether, this would be the best fit. This desk doesn’t have a unique look but when it comes to quality, it is far ahead of its competitors. I must say, this brand believes in quality, not in looks. 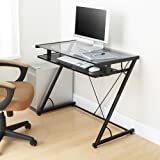 If you’re running on a tight budget and urgently need a computer desk, go for this one. You can’t get great quality packed with solidness like this desk for such an affordable price. The crisscross cherry colored legs of this desk are designed in a way that they provide ultimate support to the table top. The table can hold a lot of weight and function all well. 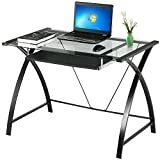 This desk is similar to Best Choice Products L Shaped Computer Desk in appearance, design, features as well as functionality but what made it ranked first is its smoothness which makes work easier and also its popularity among the users. This desk is equipped with many features but you can assemble it easily. It’s the ideal fit for a multi-tasker. Other than having the 5 years warranty, this desk has all the features what other desks have.